Addressing food security is one of the key project activities for the Wildlife Conservation Society Papua New Guinea (WCS PNG) Programme. 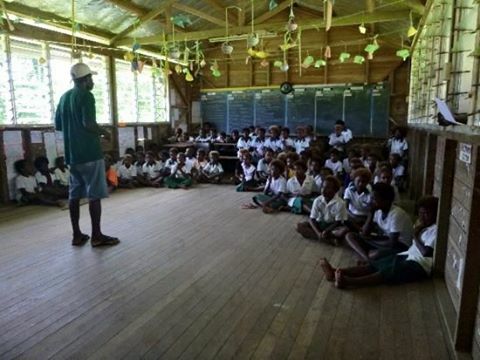 WCS recently completed a soil fertility and pests & diseases management training with 75 locals from the Tigak Group of Islands in New Ireland province from the 6th-13th June. It was the first of its kind for the participants of Salapiu, Bangatan, Kapatirung, Enuk and Kaplaman island of the Tigak local level government. WCS New Ireland’s Agriculture officer and training facilitator Jeffery Binifa said the infection of food crops by pests and diseases was the major food security issue faced in those islands. Training sessions on pests and diseases management included control measures using locally available plants that could act both as pesticides and fertilizers. Bird’s Eye Chili, Derris roots and Tobacco leaves were some of the plants introduced to the participants as local pesticides. “The chili and derris roots can be combined for better protection of crops because it acts like Karate (an insecticide sold in shops). It is used to control pests that affect vegetables,” explained MrBinifa. “It becomes a broad spectrum insecticide that can be used on leafy vegetables like aibika, the English and Chinese cabbages and even broccoli,” says Binifa. He further explained that planting of tobacco and chillies among vegetable plots repels off insects from affecting the leaves. He said these plants protects and helps vegetables produce better and healthy yields. The training sessions on soil fertility management included cost effective methods like the use of compost and kitchen waste, the use of legumes plants like the soya and mung beans and other common leguminous plants to improve soil fertility. “New Ireland’s soil formation is mainly of corals and we need good soil to yield better food crops,” said Binifa. Use of manufactured fertilizers were discouraged due to the high cost involved. “Similarly chemicals are expensive and dangerous if care and attention is not adhered to, therefore, use of locally available plants to extract chemicals to use was discussed and taught,” said Binifa. NasonSangin, pastor and local gardener from Salapiu island said the training would help them use the plants rather than purchase expensive chemicals in town. Sangin also expressed concerns over the lack of government presence in their communities to address agriculture and food security issues.